I began serving churches in the capacity of student intern the summer I graduated from college. Duke Divinity School selected a few of us for summer internships, funded through the Duke Endowment. We were sent to churches in communities of under 1,000 in population. When I got the word of where I was being sent, I thought “Where is THAT?” The card said “Horseshoe, North Carolina.” I’d never heard of Horseshoe. I learned the actual church was Mills River UMC with the address of Horseshoe. I would be staying at the home of a physician whose office was at a major intersection in this little rural community about twenty minutes south of Asheville. The afternoon after graduation, I was driving in my car to this new place. No down time, and getting ready for my new adventure the next day as a part of the staff of this church I knew absolutely nothing about. The family’s hospitality was gracious. I was given a room that served as their family room, but had its own outside entrance so I could come and go without disturbing the rest of the household. I slept on a sleeper-sofa, and had to vacuum the “innards” of the mattress off the floor each day as it was disintegrating. The family provided my breakfast and I was to go to different homes that had signed up to feed me supper each evening. I was on my own for lunch, and didn’t need much then as the other two meals were more than sufficient. The congregation met in a beautiful Civil-War era brick church that was located on an old road that turned up off the river road. The hand-made chestnut pews were not real comfortable, but the congregation was full in this chapel, and the music was led by an able choir and an organist who had a warm and loving spirit. The pastor of the church, who was assigned to be my supervisor, was a friendly younger fellow who reminded me a lot of David Letterman. He had a beautiful family with kids that loved attention, and I began to learn under his tutelage how to be a pastor. The congregation was a unique mix of people. Several were members of families that had spent several generations in this place, a valley that produced a lot of agricultural benefits. These families worked hard at farming and struggled with the changes that were occuring in those mountains related to another group, the “snow-birds.” Several Floridians flooded these mountains in the summer, having been drawn to the cultural life of the greater Asheville area. Mills River was between Asheville, Hendersonville, and Brevard. At Brevard a summer music program hosted youth from all over who produced very high quality productions: operas, musicals, and concerts. Hendersonville was the county seat and had the area shopping center and a little industry. Asheville was the largest nearby place, with a complex cultural offering including an arts community, and was a stop along the Blue Ridge Parkway, with a major tourist attraction in Biltmore House. A brief history of the church is available here. 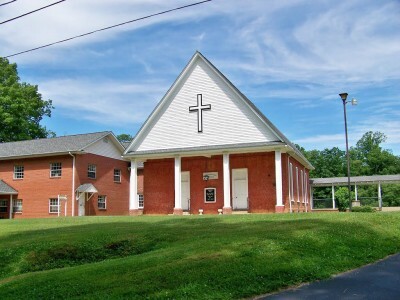 I spent twelve weeks that summer in this place, learning some basics of pastoral ministry: visitation, worship planning, preaching (I think I got to preach one time), and some servant ministry. I was sent one week to Camp Tekoa, a United Methodist camp near Hendersonville, where I was to work with a special needs camper. My camper didnt’ show up until midweek, so I was without anything to do the first few days. When he arrived he was a round-the-clock case, and nearly had me whipped by the time his mother came to pick him up. Still, it was worthwhile to learn to pay attention to someone else’s needs, especially in my 22-year old state of mind. I didn’t accomplish a lot those twelve weeks, but I got to know some very sweet people, and to walk with some of them through some tremendously tough times. I felt a close affinity to the early circuit riders of Holston Conference (whose territory this used to be prior to the 1890s development of the Western North Carolina conference). At the end of the summer I packed up my little red Mazda hatch-back and headed to the big city of Durham, NC, where I would be enrolling in classes at Duke. While I never lived there after infancy, I know that area of NC. I was born in Forest City, not far from Hendersonville. My company in CA hired a retired U.S. Army General whose condition of employment was an office in his home town, Hendersonville! On business trips there, I stayed in the hotel on the main street, a hotel that had rocking chairs on the porch along the main street. During my high school years I lived in Gaffney, SC, only a few miles away from Forest City. My Stepmother and sibs sang at churches like that described. I went with them to hear them sing. Yes, I know that area.